Born and raised in Eskilstuna, Sweden, surrounded by nature and Viking runes, Erica loved to paint from an early age. It wasn’t the acrylic set or the easel stand she received at age 7 that had her fall deeply, it was the watercolor set with individual paint boxes and the beautiful ceramic palette she bought that matched the detailed and delicate way of painting she knew felt more like home. She still has that same watercolor set in the studio three decades later. She sold her first painting at age 10 of a small simple landscape with a single red balloon floating in the air. She continued to paint throughout her teens, finishing watercolor pieces while on the phone with her girlfriends or while traveling in Europe. To her, it was an essential way of being. To be a big-hearted creative was as valued as anything else when Erica grew up. Her mother was always busy with a new creative project (and is also a fine arts painter and crafter whom Erica has exhibited “2 Generations” with) and her mother’s father was also a painter, woodworker and gardener. Their art hang in Erica’s studio as a reminder of how her creativity was inspired, nurtured and valued. After moving to the U.S. at the age of 20 to continue her studies in communications, she revisited acrylics after years of working with watercolors. And when she played with acrylic paint again, she applied the technique she’d used with watercolor – diluting every brushstroke with water – and she had found her style. Finally, the bubbling creative feeling from within matched what came out on canvas. Her art flowed, without falter, directly from her heart out through her arm, hand and brush. She received her first commission after an exhibit in Virginia at 25 of a half-shaped sunflower, which followed her first large triptych statement piece for a living room. She continued to do commissions as she exhibited in national juried art shows up and down the East Coast, while shaping her PR career and creating a home with her college sweetheart – another fellow big-hearted creative. Erica’s last name is Eriksdotter which means “Erik’s daughter” in Swedish and she is named after her father, Leif Erik Larsson. Her father traveled all over the world, yet managed to always be present in Erica’s and her sisters’ lives. He inspired her to dream big and ‘just go for it,’ as he used to say. She is proud to sign every painting with “Eriksdotter” and is honored when customers say they have their own “Eriksdotter” in their home. Erica works the same way the old masters did, one brushstroke at a time, taking no shortcuts. 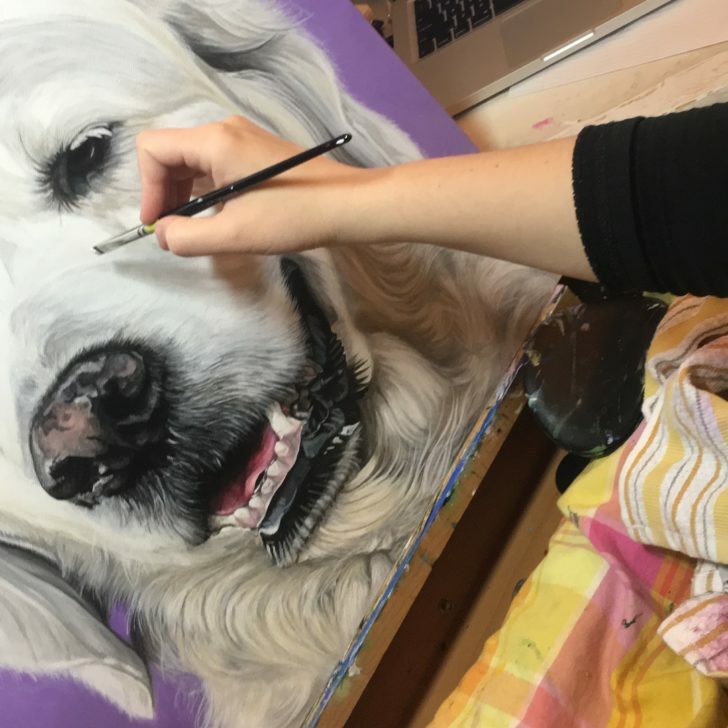 She starts her commissions with a pencil grid directly on canvas for a rough outline before putting down the first thin layer of paint. The beginning phase of a commission can be rough on the mind, like chipping away stone to make a marble statue but with the brain and heart. The middle phase is the foundational work when thin layers are applied on top of each other and larger brushstrokes can make for a tender arm. It’s in the final phase when Erica thrives. This is where all the details are applied and the painting subject comes alive. Some paintings are more difficult than others, and some just need more nurturing. Others can be done very quickly. Erica feels each painting gets the right amount of time it needs before it’s finished. Erica thrives on commissions, a notoriously difficult work for fine art painters. She loves the collaboration with her customers and respects and admire the bravery it takes to trust in her talent to create a piece of art that nobody else has with more meaning, backstory, layers of culture, depth and generational mileage than many anything else they own. That’s why it’s special that many, many come back for their second (or fifth!) commission within a couple of years. Erica loves painting pieces that bring deep nurturing joy and love to her customers. She strives to make people happier with her art and through her art she endeavors to make the world a better place. Art is about celebrating life with color, making the viewer feel all the love that went into creating the piece and the vibrancy of life. She believes her paintings have healing qualities which vibrates on a high frequency and her customers often share how wonderful they feel when viewing their finished paintings. Erica has customers all over the world and her art has been mentioned in national media, such as Martha Stewart Weddings, Bridal Guide and IHAVECAT. 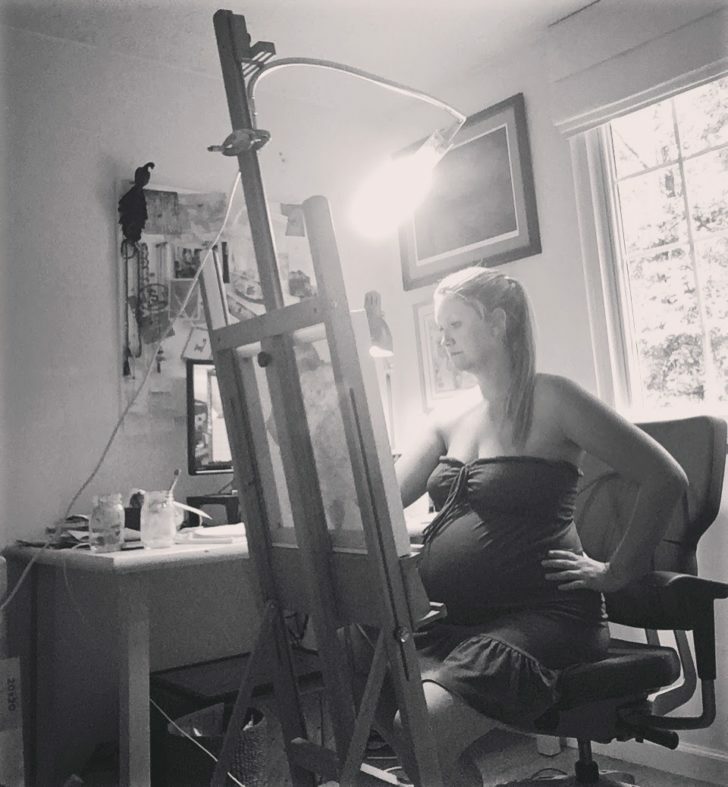 She lives in Reston, Virginia, with her husband, Casey, their son, Mason, and their two cats, Lola and Rasmus, who often joins her in the studio. 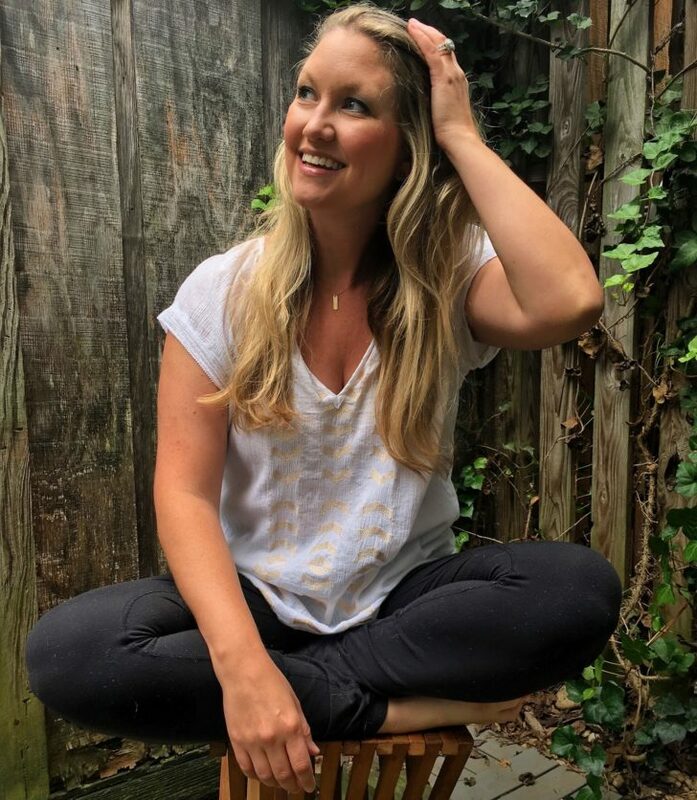 Learn more about Erica by joining her tribe below and receive monthly inspiration.